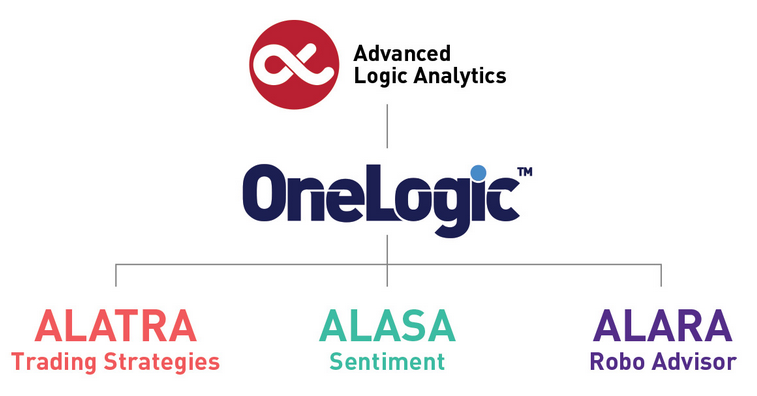 Advanced Logic Analytics aims to give investors a window into market opportunities and an edge over the market. Their proprietary, AI-driven, algorithmic trading, market sentiment, and investment analytical solutions help financial firms capitalize on market swings, reduce downside investment risk and achieve upside potential for their portfolios. Q: Could you tell us something more about the company and your history? A: The company was established in 2015, 2016 was spend on R&D and establishing the right team, we then launched in January 2017 and our solutions are based on more than 10 years of academic research in the fields of behavioural science and data analytics. Through our team of leading academics, we have developed unique solutions using behavioural, sentiment and emotional finance to give investors a window into market opportunities and an edge over the market. Q: What is OneLogic and how does it work? A: OneLogic is a suite of solutions providing the basis for a range of analytical tools tailored to different financial markets firms. The current product range comprises different AI-driven algorithms, augmented with sentiment analysis, to drive multiple products within our OneLogic suite. These include: Trading Strategies (ALATRA), Sentiment (ALASA), and Robo-Advisor (ALARA). ALATRA – Trading Strategies: Financial firms implement a broad range of trading strategies in pursuit of alpha. They also develop their own statistical models and applications to help outperform the market. We developed ALATRA to add complimentary algorithmic trading strategies to an institutions own strategy. ALATRA’s underlying algorithms focus on the entire distribution rather than a few statistical moments, leading to reduced downside risk and enhancing upside potential. ALATRA analyses a portfolio and then rebalances this to a new portfolio using advanced mathematical models that consider future uncertainties in asset return, interest rate, inflation and liabilities. It identifies and catches signs of bubbles, market trends, overconfidence in M&A deals, and other useful indicators, in any language, and across jurisdictions. Firms also receive a daily buy/sell trading signal. Initially applicable to equities, ALATRA’s models can be applied to almost any asset class. ALASA – Market Sentiment: With traditional alphas getting tougher to exploit, traders are turning to innovative sources of data to help develop new strategies. ALASA captures ‘collective wisdom’ and is a proven solution to cognitive problems. It helps trading firms and individual investors make sense of human and market signals faster and more extensively than ever before. ALASA uses WebCrawler algorithms to gather information within messages from domain experts in specific expert forums. Natural language processing algorithms translate these messages into sentiment and that sentiment is weighted based on the “past performance” of the respective expert. The output of this analysis is then blended with other news, data and sentiment feeds, with machine learnt weighting applied to the most reliable indicators, producing a highly accurate signal based sentiment feed. Capturing the mood of markets provides early indication of unprecedented events, helping gain an edge in traders’ portfolios before they impact the markets. Professional and individual investors use ALASA via desktop or App to analyse the sentiment of 150,000+ assets (stocks, forex, indices & commodities), market news and social media, and get ahead of the markets. ALARA – Robo-Advisor: It’s our opinion that traditional robo-advisors are based on rigid models, such as the Markowitz model, and can omit wide-ranging information sources. ALARA is a ‘next generation’ robo-advisor and offers investment advice based upon macroeconomic factors augmented with financial news, company performance data and market sentiment analytics. ALARA helps businesses and consumers make more informed investment choices and facilitate affordable, responsible and trustworthy investment decision support. Most traditional robo-advisors deploy a “one size fits all” approach. The way in which ALARA has been designed means that it can be recalibrated easily, to changing market conditions for example, and used to test different input parameters. This approach is unique because ALARA allows the financial advisor to include specific individual information (personal and financial circumstances, financial goals, etc.) and applies rigorous and innovative mathematical approaches to determine optimal portfolio compositions. It covers a compelling ex-post risk analysis and sophisticated asset allocation recommendations. ALRAA can be used by relationship managers to help improve the customer experience or white-labelled by financial institutions to offer robo-advisory to their own clients. Recommended: Android Customization Tips You Should Definitely Use In 2018! Q: Please tell us a little about the technology that drives your platform? A: Advanced Logic Analytics has spent the past two years stress testing various technology solutions to build the right platform on which to perform its advanced analytics. 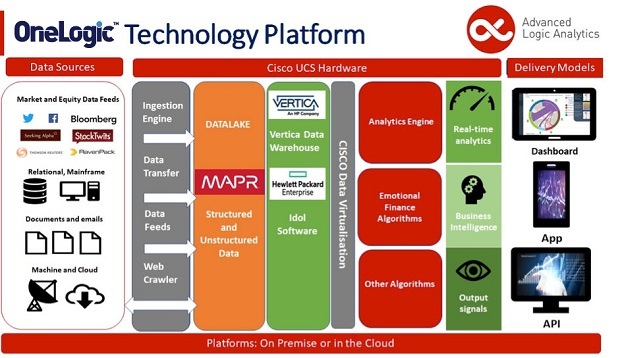 The One Logic Technology Platform is built upon a combination of MAPR, Cisco and HPE technologies, with a presentation layer in Tableau. This architecture takes advantage of Cisco hardware and data management breakthroughs alongside HPE’s industry- leading Big Data analytics software for structured and unstructured data (HPE, Vertica and Idol). The platform can be delivered as an on-premise solution or hosted in the cloud. Structured and unstructured data is gathered from a range of sources, depending upon the client and application. These might include high arrival rate feeds such as Bloomberg, Twitter and Facebook, structured client data, unstructured client data and news or web generated data. These multiple streams are harvested and then ingested into a datalake where the data is homogenised in order for the analytical algorithms to be able to process it. Outputs are then conveyed through an interface depending upon the application. Q: You’ve recently announced the appointment of a new CTO; could you tell us something more? A: Technology is moving so quickly, and as we expand our offerings we wanted a CTO with a strong connection to new technology, understand what’s possible, and what the alternatives might be. And similarly, we needed someone with an intense focus on customer needs. Capital markets firms are aggressively innovating and integrating new technologies. Our new CTO provides a lot of guidance around understanding technology alternatives that might help us and our customers do those things better. A: We have big ambitions for 2018. We will continue to expand on our trading strategies and sentiment solutions across different asset classes over the coming year. We’re currently looking to build a predictive market analytics product based upon research into emotional finance. Emotional finance is a new paradigm in the understanding of investment activity and prediction of asset prices and market behaviour. By directly acknowledging the vital role investors’ unconscious needs, fantasies and drives play in their investment judgments, emotional finance provides a practical framework that can help explain and predict those aspects of investment decision making and market activity not open to rational models and conventional perspectives. We are also using our algorithms to launch a joint-venture quant-based hedge fund in the second half of 2018 with an award-winning hedge fund.